Beautiful Resort Living Fronting Golf Course Villa with 3 Bedrooms, 3 Bathrooms, Walk to Beach, Swimming Pool & More! Welcome to the beautiful Waikoloa Beach Resort, a tropical oasis amid the dramatic backdrop of virgin, black lava fields. This beautiful unit comprises of three bedrooms, three full bathrooms, and accommodates up to eight guests. The interior has a relaxed vibe and is the perfect getaway for friends and family. A pleasant light-filled entertainment living room is the ideal spot to put your feet up and chill out and consists of a large flat screen TV with Sony Blue Ray DVD player, Also provided for your family fun are a generous library of books, DVDs, games, puzzles, playing cards, beach chairs, three boogie boards, beach umbrella, large rolling and small hand-held cooler. The gourmet kitchen comes fully-equipped with high-end appliances and all the cookware to help create a delicious meal. The indoor dining area seats eight with additional seating at the breakfast bar for four more. 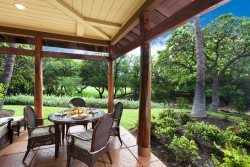 Adjacent to the kitchen is a covered dining lanai with seats for four. Three bedrooms, each designed for the utmost in comfort, privacy and optimum views. The master suite features a king-size bed, flat screen TV, and a private balcony with artistic patio furniture. The second guest suite features a cozy queen-sized bed, flat screen TV and attached bathroom. Upstairs Loft area includes a desk area, wireless internet, and queen-sized sofa sleeper. Plaza level guest bedroom includes two twin sized beds, TV/VCR Player. Central air conditioning (temp control to 74 degrees), full size washer and dryer, ironing equipment, housekeeping items, beach chairs & towels, boogie board provided for your enjoyment (and subject to the previous guest returning to the unit). This unit has a designated parking spce for one car. (No garage access). Located across the street from the newly built Queen's Shops, complete with food court, art galleries, sushi, ice cream, Macaroni Grill, Island Gourmet Market, Starbucks, and many other shops as well as daily local entertainment, classes and cultural events. Also within a 3-minute drive is the famous Anaehoomalu Bay (A-Bay) beach with all the joys of white sand, trees, snorkeling, and more. Further down the road (10 to 15-minute drive) are other local beaches, whether you want the pristine white sands of Hapuna Beach, or the rocks, trees, and safe entry spots of nearby "Beach 69" (at mile marker 69). Professional,courteous, responsive staff. Everyone we interacted with was wonderful. This was not our first stay at Waikoloa Beach Villas, its beautiful, very well maintained, quiet and managed well. I truly do adore Resortica. I had the good fortune to happen across your agency when I visited Hawaii in 2016, and was overjoyed to find another property when we came in 2017! I look forward to using you all again in the future, and have been recommending you to my friends traveling there as well. Mahalo and thank you for a lovely stay. Our only issue was with the wifi - it was out quite a bit and had to be reset quite a few times. Everything else was fantastic and everyone agreed they would return! I really appreciate the company and try to rent from you when we come. We are always looked after and don't have to worry if something needs to be addressed. The connection to all about babies rental was a huge help to this trip with an 18 month old and an almost 3 year old. It would have been much less pleasant with out the rental toys and gear. Worth every penny for delivery and pick up to the unit. Very friendly staff. Answered all my questions prior to my booking. Excellent property we liked it so much we hope to return again! We had a great time we didn't want to leave. The staff was wonderful. They were very informative and friendly. They helped us with everything we needed. The team is excellent! One of the units we rented was beautiful & spacious, unfortunately too many stairs for a family member to climb...which caused a heart episode to occur. Fortunately, we called(after hours) to change to another unit without stairs & we were accommodated quickly. We were able to enjoy our weekend! We are so appreciative of the answering service team for responding quickly to management & the management team for caring for matters of the heart! Family, fun & true display of the "Aloha" spirit! Mahalo for your support! We will be returning soon! Hawaii resortica team & the properties available are awesome! Thank you again for you love & support, which made our stay a fantastic & memorable one! We look forward to our next holiday at WBV! Resortica has been such an amazing company to work with! From reservations and helping us accommodate our bigger party. We have been staying in the Wailoloa Beach Villas for many years now, and every time I have had a positive experience. We received a late check out to 7pm at no charge, which was truly amazing as our flight didn't leave until later that day. I was so impressed that the housekeeping staff found the little purse (with money) and let us know right away. And the resortica employee who made a huge effort on a saturday to get the purse to a friend. Resortica staff provided excellent service. The speedy responses to emails and phone calls were greatly appreciated. Waikola Beach Villas is a wonderful. Loved the resort. Vacation home was beautiful and exactly as seen in photos posted online.